Leaders can shape an organisation through their behaviours and their vision. If an organisation lacks a clear vision or there is disengagement by the leadership team, then the results can be disastrous. In such circumstances change is needed. When change is needed, the value of safety can become a change agent. From the disciplines of leadership and safety comes the emerging topic of safety leadership. Through safety leadership, workplace challenges can be rectified and the desired behaviours reinforced. These challenges can span from a lack of leadership engagement, poor safety performance, complacency or lack of safety ownership. Understanding how safety leadership differs from other leadership theories can give you a competitive edge which is not solely based upon financial quotas, but instead based upon the moral code of ensuring the health and well-being of your employees. This book goes beyond mere safety slogans or anecdotal stories that relate to safety leadership. Instead an empirical and research-based approach will be shared which can help improve the overall culture of an organisation as well as the safety of employees. Tools, case studies, theories and practical applications will be shared which can help create the blueprint for organisational change that you seek. Even when things are working well, constant innovation and adoption of best practices can help companies go from good to great and leave a lasting legacy for employees and customers alike. 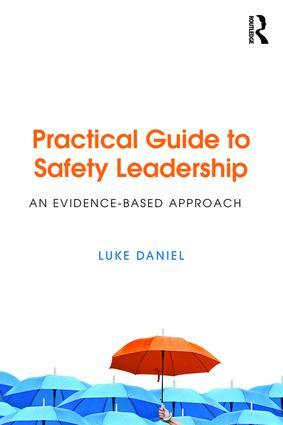 Detailing the mechanics of safety leadership, this book will drive the change and results you want. Overall assumptions: what context is relevant before you proceed? Luke Daniel is a registered psychologist with over 15 years’ experience consulting, coaching and developing leaders across the globe. His work has included facilitation of workshops across multiple continents as well as analysing workplace culture.